Are all bike computers created equal? Not really, as Polar has come up with the Polar M460 which will be the culmination of wearable sports and fitness technology knowledge which has been amassed since the past four decades. The Polar M460 will arrive in a sleek, all-black and fiber-like surface texture that will deliver an improved button grip, while being equipped with integrated GPS, additional power meter compatibility, advanced power metrics and smart coaching, and Strava Live Segments. In other words, the $179.90 Polar M460 is being marketed as the ideal training tool for cyclists who would like to achieve their fitness or cycling goals. There is far more value to that price point than meets the eye, since it will be accompanied by a two-month Strava Premium membership. 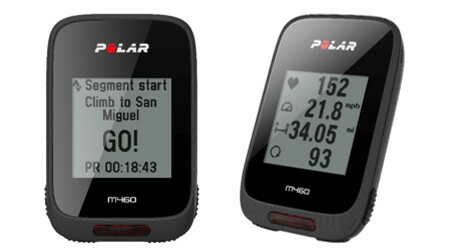 This versatile Polar M460 will boast of reliable, built-in GPS and barometer-based inclinometer, while sporting compatibility with a wide range of third party power meters and advanced cycling power metrics. Among them include notable names like Training Peaks’ Normalized Power, Intensity Factor and Training Stress Score, in an effort to make training more efficient. As cyclists remain connected, the Polar M460 will also boast of smart notifications for incoming calls, texts, calendar alerts as well as social media updates, in addition to Strava Live Segments so that cyclists can check out their stats in real-time, allowing them to achieve peak performance while sharing their experiences with one another over social media. Just in case you feel that you would not want to go out cycling that day because of a slight drizzle and would not like to damage the Polar M460, fret not. The Polar M460 has IPX7 rating water resistance, in addition to a battery life that delivers up to 16 hours of training as well as a front LED light for additional safety.